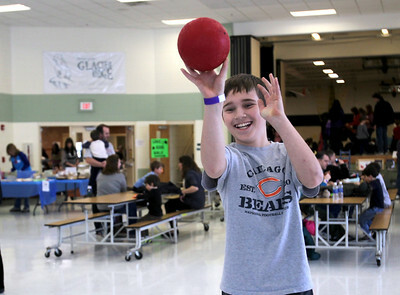 Monica Maschak - mmaschak@shawmedia.com Sam Baser, 10, shoots a ball into a hoop as one of the carnival games at the 17th annual Silent Auction and Family Fun Fair Glacier Ridge Elementary School on Saturday, March 2, 2013. The fundraiser offered a silent auction, carnival games, book and cake walks, food, a bonus raffle, theme baskets, wine and dine packages, and more to benefit the Carl Wehde Early Childhood Special Education Center. Monica Maschak - mmaschak@shawmedia.com Claire Brock (left), 3, and Karissa Whitehead, 3, emerge from a bouncy house with static hair during the 17th annual Silent Auction and Family Fun Fair Glacier Ridge Elementary School on Saturday, March 2, 2013. The fundraiser offered a silent auction, carnival games, book and cake walks, food, a bonus raffle, theme baskets, wine and dine packages, and more to benefit the Carl Wehde Early Childhood Special Education Center. 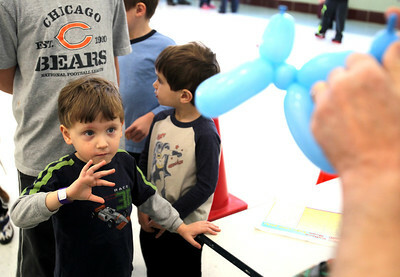 Monica Maschak - mmaschak@shawmedia.com Braden Braun, 4, anxiously awaits the making of his balloon animal during the 17th annual Silent Auction and Family Fun Fair Glacier Ridge Elementary School on Saturday, March 2, 2013. The fundraiser offered a silent auction, carnival games, book and cake walks, food, a bonus raffle, theme baskets, wine and dine packages, and more to benefit the Carl Wehde Early Childhood Special Education Center. Monica Maschak - mmaschak@shawmedia.com Volunteer Brooke Millard (left) waits for Chase Stramaglia, 3, to choose what ice cream and toppings he wants at the 17th annual Silent Auction and Family Fun Fair Glacier Ridge Elementary School on Saturday, March 2, 2013. The fundraiser offered a silent auction, carnival games, book and cake walks, food, a bonus raffle, theme baskets, wine and dine packages, and more to benefit the Carl Wehde Early Childhood Special Education Center. 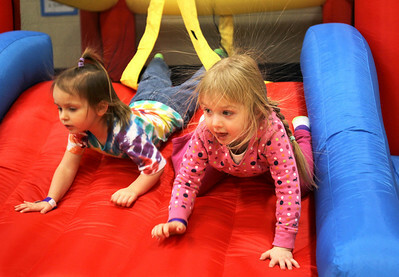 Claire Brock (left), 3, and Karissa Whitehead, 3, emerge from a bouncy house with static hair during the 17th annual Silent Auction and Family Fun Fair Glacier Ridge Elementary School on Saturday, March 2, 2013. The fundraiser offered a silent auction, carnival games, book and cake walks, food, a bonus raffle, theme baskets, wine and dine packages, and more to benefit the Carl Wehde Early Childhood Special Education Center.